We have been receiving many requests and queries from genuine SSC CGL 2017 aspirants about the problem of Date of Age Limit Reckoning for SSC CGL 2017 Exam which is 01-08-2017 instead of 01-01-2017. 1) On 03-11-2016 SSC issued a Notice in their website about date of reckoning of age for SSC CGL 2017 will be from 01-08-2017 instead of 01-01-2017. 2) They did same thing in SSC CGL 2015 & 2016 but later changed date from August to January by Corrigendum/Notice. 3) A lot of Candidates will Suffer from this decision, a few candidates wrote messages on Qmaths Fb page / website & Urged us to write on this issue. 4) It can be change by sending a large number of grievances to SSC / DOPT, So for these people I request you all to send your grievance to above concerned authority & help them. 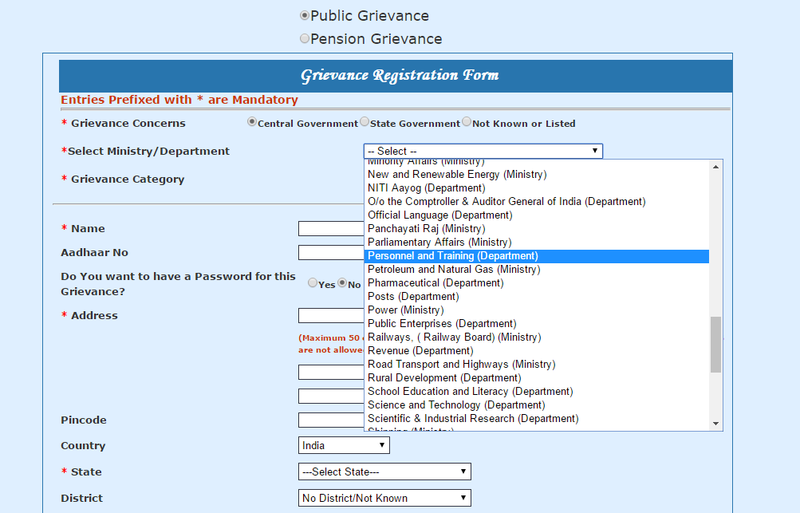 5) We Suggest all those who trapped in Date of age reckoning issue to file Grievance at PGPortal site. And keep focus on your preparations & Share this post Maximum. Here is some detailed explanation and solution to this problem. 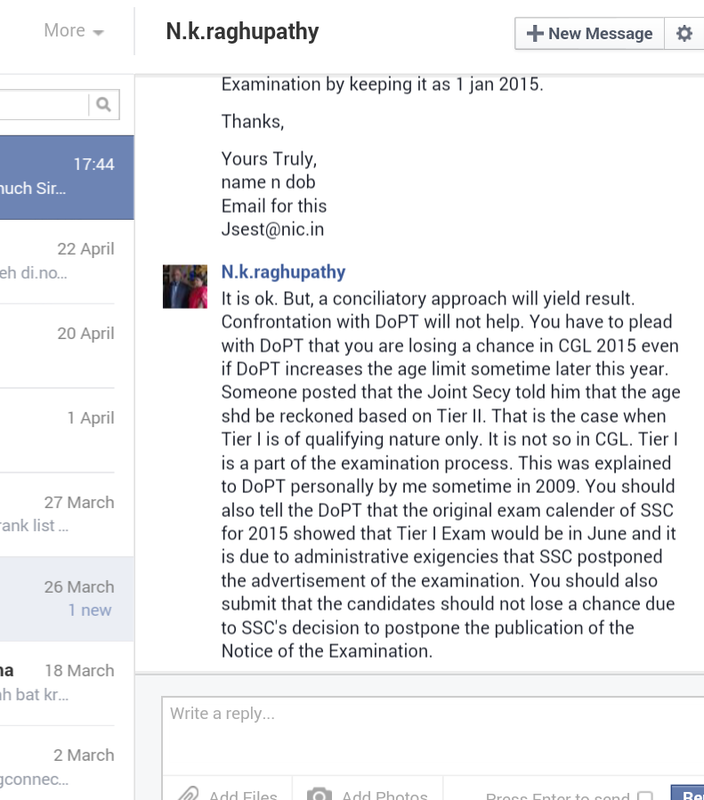 1) UPSC and SSC Follows DoPT Guidelines ( DOP&T OM No. 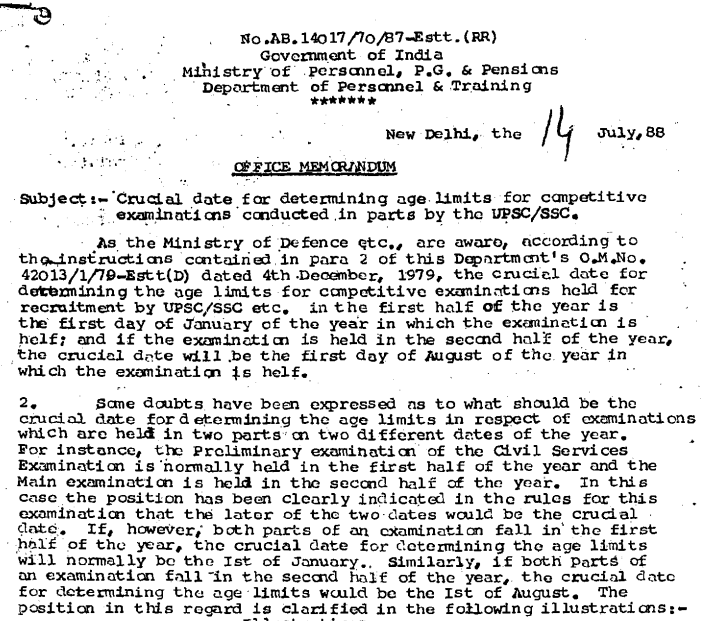 AB 14017/70/87-Estt (RR) dated 14.07.1988) for Date of age and educational qualification reckoning. Please note point no. 2 which states that Whenever an Examination is held in two parts (Preliminary & Mains) Crucial date will be decided on the basis of date of Mains Examination. 3) According to former SSC Chairmen N.K. raghupathy this rule (Not explicitly mentioned anywhere) is for the exams in which prelims is qualifying and marks are not added. But in SSC CGL prelims Marks are counted so the date of reckoning should be according to Preliminary (Tier 1) Examination. 4) On this basis SSC has issued Notification for SSC CGL 2012, 2013 and 2014, and added addendum/Notice for CGL 2015 & 2016 on large request from aspirants to DoPT. 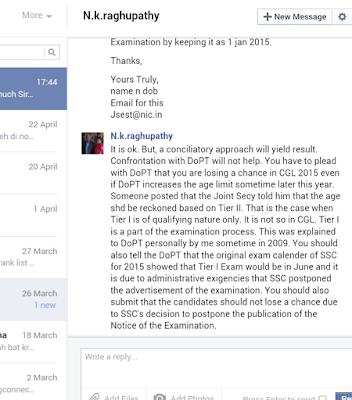 5) Remember this is not your right this is merely a request from all genuinely affected SSC CGL aspirants. See N.K.Raghulapthy View over in Picture at the time of CGL-2015. So be polite in your request. 6) In SSC CGL 2015 and SSC CGL 2016 DPT has Considered Request of SSC CGL Aspirants. 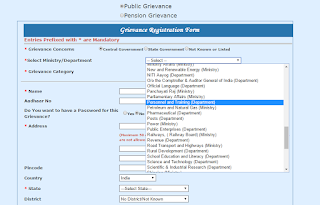 1) File a Grievance at PgPortal website. 2) Write e-Mails to Concerned SSC & Dopt Officers. 3) Write letters via post to the concerned offices. Aadhar card, mobile no. and email id is not mandatory. 3. click the box "I agree that my grievance does not fall in any of the above listed categories"
All of those who are affected must unite and send Grievances at large, and also share this post to reach maximum aspirants. If you want to give some suggestions or edits please give your feedback in comments.